Collects Dr. 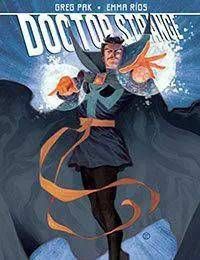 Strange: Season One, Doctor Strange (2015) #1.How did Stephen Strange become Earths Sorcerer Supreme? Find out in a high-flying, globe-trotting, window-crashing, ghost-battling adventure from the earliest days of Stranges magical training! Part Indiana Jones, part Lord of the Rings, this uncanny origin story reveals how a selfish, arrogant surgeon collided with a hot-headed martial artist to become the greatest team the mystic arts have ever seen! But can Strange and Wong stop hitting each other and figure out how all this magic stuff works, anyway? Plus: Years later, an older and wiser Doctor Strange is all that stands between Earth and the forces of darkness. Every act of magic has its cost, but has Stephen been paying his tab? Get spellbound by the past and present of a Marvel hero with a big future!